Its initial purpose is to create an extension for Komodo, but these elements could easily be reused by any XUL project, extension, or xulrunner application. 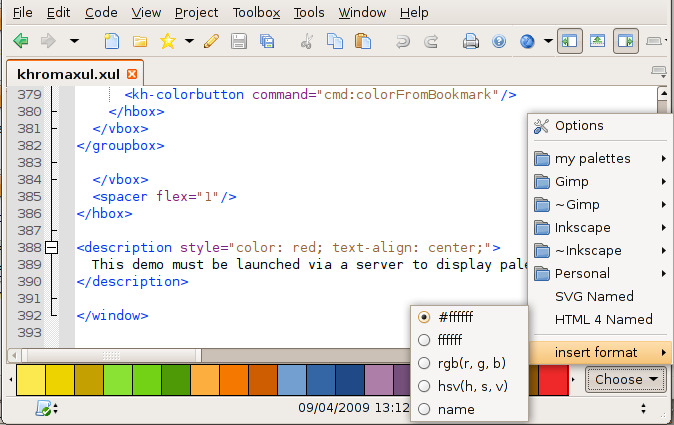 A advanced color selector, "à la Gimp", via a button or via the "Tool" menu. It's a window with several selectors in the RGB and HSV color spaces, and the ability to use color palettes (Gimp Format). If a color code is selected in the Komodo editor (format #ffffff or #fff, with or without #, format rgb(r, g, b) or rgb(r%, g%, b%), or HTML name), the selectors are initialized on this color when the window is opened. 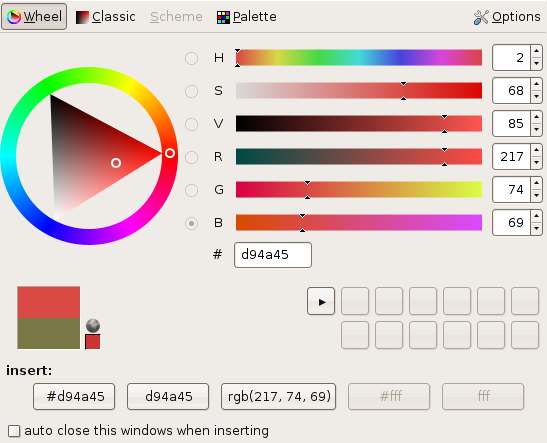 A scrollbar displaying Gimp Palettes, "à la Inkscape", on the bottom of the main window of Komodo. One click on a color insert (or replace current selection) the new color code. This scrollbar can be displayed or hidden via a button, or via the "View" menu. warning, this version is a alpha one, i.e. a test version ! These XUL demos require a browser based on mozilla >= 1.9.x (Firefox >= 3.x). A complete example, similar as the Khromaxul window in the Komodo Extension: khromaxul.xul. Each elements, simple tests: tests. Small videos on my blog, during my first tests: vidéo 1, vidéo 2.
mercurial repository on bitbucket (trunk, unstable). If you use this code in a project, I will be happy if you let me know, but there's no obligation ;) . the kh-hsvpicker[type="wheel"] element now works inside a XBL. Thanks Laurent :). gecko 1.9.1 compatibility (small correction of SVG element). add HSL color space in the library kh-color.js. The cssToRGB() function recognize more patterns ((hsv(n, n, n), hsl(n, n, n) and hsl(n, n%, n%))), and can optionaly recognize all CSS names defined by W3C (use of an optional file). implement some scheme tools (complementary colors, triads,...) "à la Agave". wheel picker, rgbpicker and hsvpicker: show dotted lines around the focused selector, and allow key navigation. remove the type="multicolor" for . A unique method applyGradient() like the one for type="multicolor should be sufficient. allow drag'n'drop of color sample between 2 palettes. some tools to sort palette colors. Extension Komodo, propose an option to use Khromaxul as color picker for the colors hyperlinks. understand and implement nsIAccessibleProvider to the elements that need it.